The third largest arch in the park, Double Arch's larger span is 144 feet wide by 112 feet high (44 by 34 meters). The smaller opening is 67 feet wide by 86 feet high (20 by 26 meters). 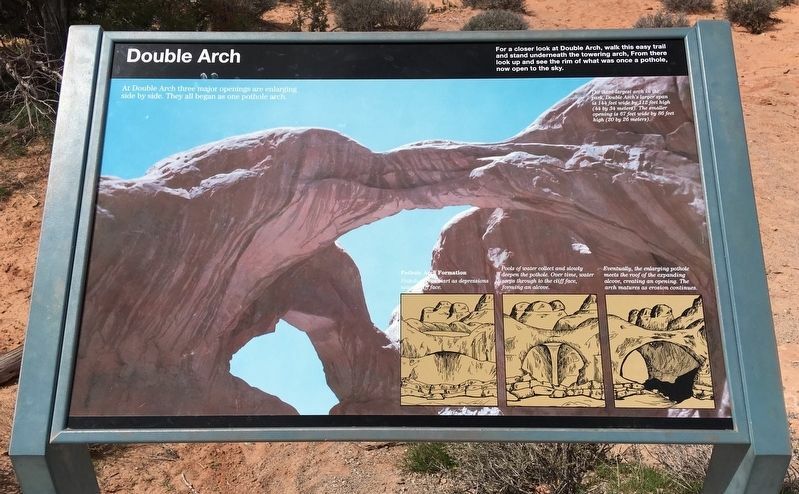 For a closer look at Double Arch, walk this easy trail and stand underneath the towering arch. From there, look up and see the rim of what was once a pothole, now open to the sky. 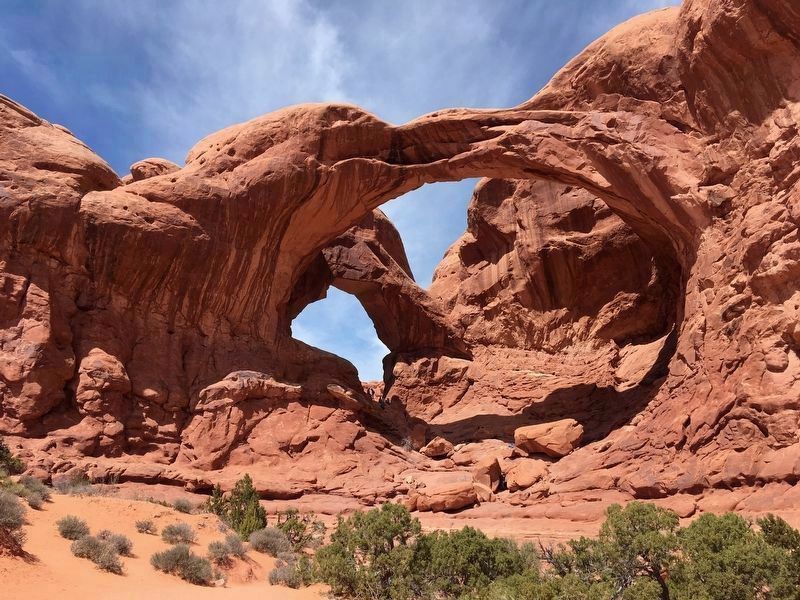 At Double Arch, three major openings are enlarging side by side. They all began as one pothole. Pothole arches start as depressions near a cliff face. Pools of water collect and slowly deepen the pothole. Over time, water seeps through to the cliff face, forming an alcove. Eventually, the enlarging pothole meets the roof of the expanding alcove, creating an opening. The arch matures as erosion continues. Erected by Arches National Park. east of Arches Scenic Drive. Touch for map. 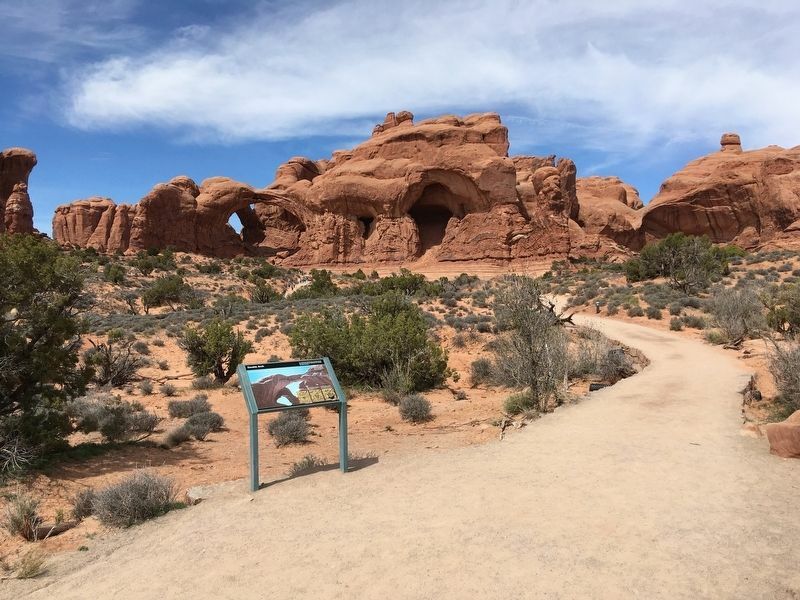 Marker is at or near this postal address: Arches National Park, Moab UT 84532, United States of America. Touch for directions. Other nearby markers. At least 8 other markers are within 8 miles of this marker, measured as the crow flies. Balanced Rock (approx. 1.7 miles away); Wolfe Ranch (approx. 3.4 miles away); Grand Old Ranch House (approx. 6.8 miles away); Moab Utah UMTRA Project (approx. 6.8 miles away); Elk Mountain Mission (approx. 7.9 miles away); Early L.D.S. Church (approx. 8 miles away); Moab L.D.S. Church (approx. 8 miles away); The Old Log Cabin (approx. 8 miles away). Touch for a list and map of all markers in Moab. Notice the people standing under the smaller opening. More. Search the internet for Double Arch. Credits. This page was last revised on April 10, 2019. This page originally submitted on April 7, 2019, by Craig Baker of Sylmar, California. This page has been viewed 51 times since then. Photos: 1, 2, 3. submitted on April 7, 2019, by Craig Baker of Sylmar, California. • Bill Pfingsten was the editor who published this page.